I have a secret talent. 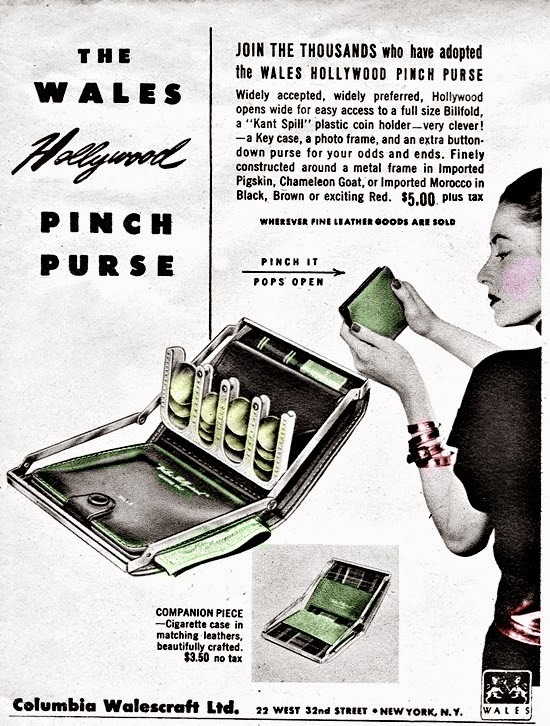 It has been passed on to ladies of my family for generations. Since women made beautiful dresses from flour sacks, we've been teaching this important skill to our daughters. Its the talent of illusion, making things look fabulous and effortless to the untrained eye. Turning a sow's ear into a silk purse- or at least something that looks like a silk purse. The other day, I posted about my husband's car accident and I had a lot of really wonderful people sending prayers, well-wishes and the like but I got a lot of flack from it on my facebook page too, because people don't see past the illusion. At first I was upset, honestly. This has been an indescribably bad year for my family and although I don't talk about it, we've struggled for a long time. But after I thought about it, I have to say I'm kind of flattered that people think that I really have it all under control and everything here is just pin curls and pretty dresses. That's my talent- making everything appear effortless and glamorous when it's not. 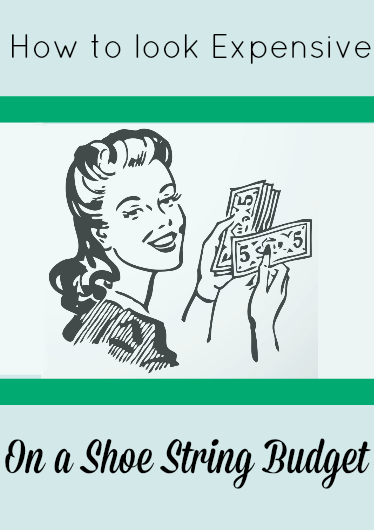 Today I wanted to talk about the truthful, un-pretty side of my life that you don't see and share my tips for looking expensive on a shoe string budget. The truth is, we're just like a lot of American families. We lived well below the poverty level most of my life. We had food stamps, we went to free clinics in church basements when we were sick, visited the food pantry once a month. Broke, baby! Now that we're adults with kids of our own, we know how to do those things if we need to. But hey, we make it work and we're happy. We still go out and have fun, we get the bills paid and life is really beautiful. It's not easy but this is what I do. Stretch every dollar and get creative. You can do it too! Thrift- First, become one with your local thrift store. Even tiny towns in the middle of no where usually have a good little thirft or junk store. My mom's town has one where I've bought blouses and bakelite for a quarter! Shop resale stores, garage sales, estate sales, etc. You won't believe the treasures you can find! Kids grow so fast too, so 99% of my kids clothes are thrifted or hand me downs. The only new items that I buy for my family are socks, shoes and underwear, although on occasion I do find some shoes that still have the tags for a few bucks. Expensive looking rhinestone jewelry, nice vintage handbags and coats can be found at many of these places for very little money. Also troll your local craigslist, check ebay and other sites looking for large collections. 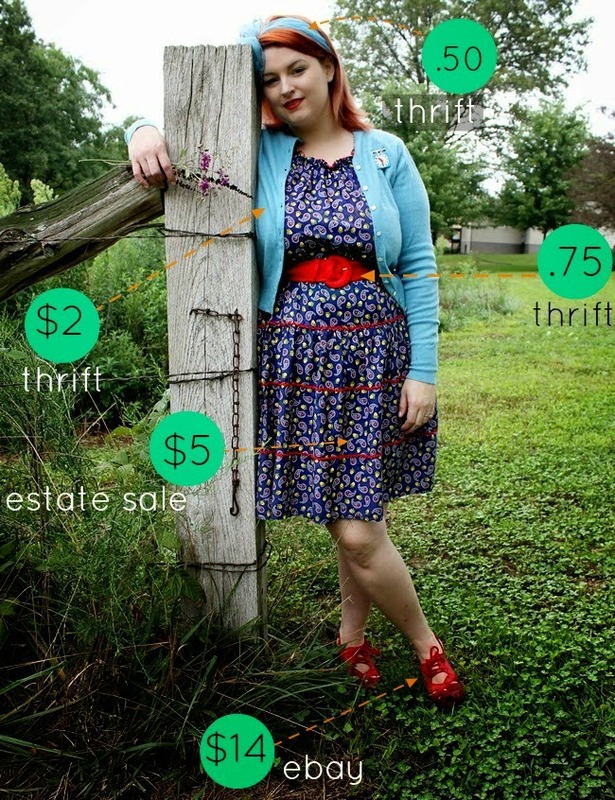 I've bought most of my vintage dresses from a local warehouse sale for $2-$6 each. Stick to the budget I also stick to a very strict rule- I never spend more than $30 on a dress and even then, $30 is a hell of a splurge for me! Also be smart and shop online sales. I fell in love with this Tatyana dress on Modcloth but at over $100, I could never afford it on my budget. They had a big 50% off sale and I had a 20% off coupon from another sale I shopped with them- 70% off, yes please! Swap with friends- I've also done a few vintage swaps with friends. We each grab a priority box and toss in clothes and accessories that the other may like and mail them off to each other. Some of my favorite things came from swap boxes. Another friend of mine doesn't have a lot of vintage but she has small kids so she sends hand me downs for my kids and I send her vintage! My son's winter coat this year was from one of her boxes.- that alone saved my family $30! Our little vintage home is completely decorated in vintage furniture and home decor and none of it from a vintage store or antique shop. My beautiful vanity and stool was a hand me down from my grandma. Our tv was free because it was broken but Pj took it apart and replaced broken parts to get it working and only spent $18. If you look hard enough and dig deep, you can find beautiful things for a fraction of the price of new things. Next time you need something, stop at 2-3 thrift stores or do a day of garage sale shopping before buying it new and see what you can find. I found these two vintage side tables at a garage sale, $30 for the set and our vintage dinette table $20 at the thirft store. All of our dishes, silverware and kitchen gadgets are thrift store and garage sale buys, including the pyrex, vintage china and coffee maker. Don't underestimate the dollar store and overstock stores like Big Lots. There, you can find inexpensive picture frames, plastic food containers, simple dishes, nail polish, towels, toiletries and cleaning supplies. Sure, you can find those things at Wal-Mart and Target but if you can cut the price by half, why not? I love to see the beautiful makeup drawers of the girls who shop at MAC and Sephora every week but holy moly, ladies, I dont know how you do it! Since I was old enough to buy makeup, I really only buy drug store brands. I did splurge once on a MAC lipstick a few years ago and it was pretty wonderful but honestly, my Wet n' Wild suits me just fine! NYX- oh I love all things from NYX. It's MAC quality at ELF prices. Try the liquid liner, eye shadows and matte lipsticks to start! ELF- ELF products are hit or miss but when they're a buck, I go ahead and try them out. They have some great little brushes from $1-$3 each, decent pencil liners and such. Their lipsticks were not great for me but I did get a chunky gloss pencil from them that I love!! I wear the ELF brow kit daily. Wet n' Wild- Wet n' Wild matte lipsticks are some of my favorite. They're affordable and nicely pigmented in all of the colors of Besame vintage lipsticks. They're about $3 each. Maybelline- The original mascara brand and one that hasn't failed me since I was 14. I love Maybelline Full n' Soft mascara and since I've found it, I've never found another I love more. Search for Dupes- a "dupe" in the makeup world is a cheap makeup that is the same color and formula of high end brands. If you have a high end product that you love but wish you could spend less on, do a Google search for the dupe! My best dupe is Revlon Colorstay foundation, which is the perfect alternative to MAC Matchmaster at 50% less! Buy Swatched makeup- my make-up addict friends often buy a palette or product just to rub a swatch on their arm to see if they like the color. It doesn't work for whatever reason and they never use it again! A few months ago, I bought my first Too Faced eyeshadows- the matte eye collection from a lady who just swatched it. It was about $5 less than the brand new price and arrived looking like it had never been touched. Check facebook for groups that sell or swap swatched makeup. I also had some swatched Stila makeup sent to me from a friend in a swap box. Use Coupons- Keep an eye on the mail box and the Sunday paper for those coupon mailers because they often have coupons for good drug store brands. Also hop over to Target.com to print cosmetics coupons for this week. Stock up on coupons for razors, shave gel, lotion and hair products. You can get sunblock for basically nothing in the summer when you have coupons! Discount Stores- Food is an area that can be tricky but once you learn the tricks, you'll save a fortune on your grocery bill! My big trick is I buy most of my groceries from Aldi or a local discount grocer, Save-a-Lot. Aldi is big now but when I was a baby, back when it was uncool to shop at Aldi and people thought their food fell off the back of a truck, my mom shopped at Aldi! It cracks me up that so many people are just discovering the wonder of awesome, imported, cheap food. I can easily feed my family of 4, breakfast, lunch, dinner and snacks for less than $60 per week at Aldi. What they don't have, I can usually find at Save-a-Lot. Aldi has gluten free, organic, all natural "fancy" foods now too so if you have special dietary needs, you can find a lot of things for less. I splurged on some organic wildflower honey last week and it's delish. They have specialty cheeses, imported chocolate and their produce has been much nicer than the junk I've bought at other big chain stores. If you like Trader Joe's, pop into Aldi, they're owned by the same company- just bring a quarter for the shopping carts. Grow your Own- Other tricks to save on groceries are some that we may not all have the time to do but if you do, try it and see how you like it! We plant a decent veggie garden with all of our family favorites- cucumber, squash, herbs, tomatoes and peppers. We freeze or can what we can't eat and enjoy throughout the off season. Make it from Scratch- I started making my own tortillas and bread recently, which does take extra time but saves a little money here and there. They taste fantastic and the kids have fun helping me, so its a win! Lights- Saving money on utilities is easier than I ever thought. It begins with one simple habit- turn off the lights! I was crazy about the light switch for a month and lowered our electric bill by $15. Next, we started shutting down computers, hitting power strips at night and insulating our home. It went down even more. Heating and Cooling- This summer, I tried an experiment. I set our thermostat to a reasonable 70-ish degrees and promised myself to not touch it for a week. Somehow, we stayed cool enough to be comfortable without keeping the house at arctic temperatures. We put up plastic window sheeting in the winter, since our old house is poorly insulated and I sewed some little things to stick under the door to keep the draft out. Use fans to stay cool and rely on socks and sweaters to keep as toasty as you like. Curtains and storm windows make a big difference for those drafty old windows too. Wash and Dry- If it's nice out (and your city allows it) hang clothes to dry outside, if you have a few minutes to do it. If your city or neighborhood doesn't allow clothes lines, you can use collapsing clothes drying racks indoors or if you have a basement, string a clothesline indoors. I don't dry everything this way but delicates, vintage dresses, sheets and such are nice to line dry. If you have a dishwasher and rely on it often, try washing dishes by hand for a month to see if it cuts down that electric bill a little bit. We don't have a dishwasher in my little 1930s home but I turn on some music or stream a movie on Netflix while I wash dishes by hand and it makes the chore fly by. Reward yourself with some pretty smelling hand lotion when you're done! No Cable TV- We haven't had cable tv since we lived at home with our parents and we haven't missed it a bit. We use Netflix, free shows on Hulu and hopefully soon, we'll subscribe to Amazon Prime. All of these services amount to about $8 per month for a streaming subscription and we never run out of things to watch. YouTube also has some old shows and documentaries to watch for free. Sure, we don't watch the news but you can stream live events online and catch up on important reads with the internet or an old fashioned newspaper. Going Out- If you like to go out, check your local events calendar for festivals, free movies in the park, concerts and plays. You can get deals on movie tickets by seeing matinees and in the winter, many theaters give free movie tickets for bringing in canned goods for food drives. Pack a picnic, go walk around the mall and see how much fun you can have without spending any money. We are lucky to live in St Louis where our museums and zoo are all free! This week, we took the kids to see Santa at Bass Pro, which we do every year. Skip the long lines at the malls and expensive photos. Bass Pro does a free photo with Santa, crafts and coloring and if you go during the week, the lines are short. Small towns have movie lights at the library, plays at the local schools, county fairs and auctions for fun. If you're in a big city, grab a newspaper or locally published magazine and see what's coming up. Do you have a library card? I'm surprised at how many people don't go to the library. You can borrow all of the books known to man kind, a huge selection of movies, magazines, music and they even have free story time and sign-up crafts for the kids. Movie Night at Home- Last winter, we started having "family movie night" where we pop popcorn on the stove and watch a movie on netflix all together one night per week. It's a big treat that we all really look forward to and it doesn't cost much at all. Sometimes we do soda, sometimes just lemonade at home and if we've all really behaved, we get dollar store candy too! I could spend a fortune on craft supplies, if I was allowed. Before I got married, I racked up my credit card mostly from buying fabric and trim for sewing! Now, I learned to shop smarter and still have supplies for the things I love to do. Search thrift stores, garage sales, craigslist and the like for fabric, buttons, yarn lots and random craft supplies for the kids. Curtains or sheets could make a great dress. We have a few shops in the area that sell left-over craft supplies at very discounted rates. Crafters bring in their bits of yarn, plastic canvas, fabric and patterns that they won't be using and people fill up a bag for a set fee. Search your area for spots like this that cater to girl scouts and teachers or organize a craft supply swap among friends. The dollar store sells scissors, glue, glitter, pom poms and googly eyes for the kids and don't forget those 50% off coupons for the craft store! Shop remnant racks for fabric too. Rewards Cards- If you absolutely must buy something new, don't do it if you don't have a coupon or if it's not on sale. I coupon like crazy on the necessities. Thankfully, we don't buy a lot of diapers anymore, since our little fella only wears them at night but when we did, we always used a coupon. Walgreens and CVS have great diaper deals, usually. My husband often got packs buy one get one 50% off or buy one get one free with his Walgreens rewards card. Coupons- Some stores allow you to stack coupons, meaning, you can use say...a target coupon for Garnier shampoo and if you have a manufacturer's coupon from Garnier, you can use both coupons on one product. If you can get food at Aldi or discount grocers, food coupons aren't usually very helpful so I skip those but I do use coupons for things like shampoo, makeup, hair products and toilet paper. The best way to find the great deals is to check The Krazy Coupon Lady. She will tell you which coupon to bring and where to go. Sometimes, you even get cash back or free items with a coupon. If you have coupons that you wont be using, it's always nice to leave them next to the items on sale for the next couponing lady to find! Scheduled Mark Downs- Another big secret is regular markdowns. Target is so good for things like this. Just go to All Things Target for the regular markdown schedule. Don't buy that $20 cardigan. Hold off and get it when it's 60% off instead! Did you know that Target has a huge, unadvertised toy clearance? I just learned about it this year and at the time, didn't have the money to shop but now that I know, I'll be hitting it next year! In January and the end of July, Target marks toys down 30-70% off. I took a peek in July and they had big Barbie houses, electronic toys and all of the expensive stuff that we wish we could afford marked on clearance. photo editing- In the beginning, I used Photoscape and I still use it 5 years later. It's free, easy to use and turns out pretty great results. In the past 2 or 3 years I also started using Picmonkey. Picmonkey has a free or paid subscription. I really use the paid functions just about every day so I subscribed and split the annual $33 fee with a friend who uses it daily also. blog design- It's really very easy to design your own blog, once you poke around for tutorials for a while. I've designed my blog myself for years. Recently, I decided to try a pre-made template from 17th Avenue Designs on etsy. I customized this template myself and I love the result! cameras- Don't feel the need to go buy a big expensive camera. You can do so many great things with your phone or a basic point and shoot. Read the manual and get to know your camera and you'll get great results. I finally bought a DSLR last year, on sale during Christmas. scanners- Any big office purchases are made less expensive during back to school season or the holidays. internet- shop around for internet service providers to get a reasonable rate. Talk to the customer service reps to see what kind of service you really need for what you do. We used to pay around $80 for service but switched to a different provider (Clear) and now only pay $49 per month with no extra fees. office supplies- I love office supplies! Pretty pens, sticky notes, notebooks for making lists and washi tape...ugh I love it!! I avoid blowing hubby's paycheck on gel pens by shopping for office supplies at the dollar store or overstock stores. Also check those crazy awesome sales at Walgreens and stock up during back to school season. Do you have any tricks to share for looking good and spending less? This is so great! It actually makes me feel a lot less weird, because I do a lot of these things, too! It can be very easy to get caught up in the crazy, money-dropping excess of the vintage lifestyle, and it can be almost frustrating when looking online at the people who, seemingly, seem to have money to buy and do anything they want. While that's probably true that many people have that much money, I'm sure there are far more that, like you, have learned the art of looking expensive on a budget. Things aren't always what they seem! Great tips! I try and live a green life and that and saving money go hand-in-hand most of the time. I make my own cleaners, repair things instead of buying new when possible, I don't use paper towels, I use reusable containers in place of baggies or plastic wrap, our heater is set to 67 and our A/C is 75 during the day and 72 at night, all of these things add up! Thank you for sharing your household tips. You always look amazing in your pictures. The fact that you are creative and frugal is all the more inspiring! Great post. Some of the tips were familiar to me but so many of them were new! Never even heard of the picture things for blogging. Definitely going to give that a go very soon. My favorite tip is to "MacGuyver" using whatever is around your house. I have a really quick turn around between shows and new costumes can get expensive. I made a pair of tear away pants last week and didn't spend a cent on them just by looking around my house. I happened to have all of the materials I needed! A lot of people would be surprised with just how much they can do if they look around for materials. Pinterest is FULL of ideas! I was a thrifter from way back (we were the ones that started calling it "vintage" in the 70s), and sewed throughout my teens and twenties to upgrade my wardrobe on a shoestring budget. Even though my family is comfortable now that I'm in my 50s, I'm still buying my luxury items on Ebay and stitching up Chanel-style jackets for a 10th of the price. I'd rather have things that are unique! Great article! These are all great tips, and I've been implementing some of them for awhile, too (three cheers for Aldi!). I'm a NYX girl, too, and ELF is a lifesaver (I love their $3 waterproof mascara, if you haven't tried it). Great tip about the library. Oftentimes classic films can be hard to find on Netflix, but the local library usually has some obscure titles available. Also, a Hulu Plus subscription includes hundreds of Criterion Collection films for about $11 a month. I love that! Brittany, wow, thank you for writing such an in-depth, heartfelt, thorough, and very relatable post. I think a lot of people assume the same sorts of things about me, too, but in reality, things are a million miles from perfect and we are perpetually on an uber tight budget (that's not helped by my extensive medical and medication bills every month, nor the fact that my health prevents me from holding down a 9-5 type of job and bringing in a serious pay cheque from having that kind of employment). We watch every dollar we spend, are far from in an ideal spot economically, and yet are usually happy and content with a lot of things (at least when we're not talking about our financial situation). Money is important, but it isn't everything and that's something our foremothers and fathers knew better than most these days, if you ask me. This post should be required reading for the whole world - bloggers and non-bloggers alike. Few us have it all in reality and even if we're well on the way there, our lives can only be enriched by consistently making smart economic choices (as my husband is very fond of saying, wealthy people don't stay that way by spending their money like it's water). Again, props on penning this excellent post and for calling things like they are. I read vintage blogs, and the way people talk about their "cheap" 30 dollar dresses, I admit I gave into envy and all that. I make my dresses from thrift store sheets, mourn that ALDI isn't in my current city, only buy ELF and wet n wild makeup, and use the most basic cloth diapers, try to hang dry my laundry as much as possible, etc. I have a lot to be thankful for, the best husband in the world and 3 awesome babies, and by the mercy of God no health problems for any of us. But the last 4 years have had their stresses too---job loss, my poor husband having a near-mental breakdown from a nightmarish job, a ton of fruitless job searching, no health insurance and then a really awesome free Christian clinic came through, having to go on medicaid for my pregnancies, and now living with in laws to make ends meet while my husband goes back to school to beef up his resume a bit. Thanks for all the tips! And its good remembering, if life were too easy it would be boring. And from Fiddler on the Roof "And if our good fortune never comes, here's to whatever comes! To life!" I do have certain areas where I find it hard to stick to budget, and my husband has never had to before now (carless, single, servers working at high end restaurants conveniently don't have a lot of expenses or responsibilities), but I'm super persnickety about keeping the lights off when I don't need them, we don't have a dishwasher, I hang dry as much laundry as possible, we don't have cable, I don't have a smart phone, I hardly ever drive, make all of our bread and yogurt myself, and I keep the thermostat at 70 or 75 in summer and 62-65 in the winter. It goes a long way to being able to treat ourselves to a nice dinner periodically. Thanks for all these tips, dear friend. Many of these tips are not applicable to my country, but still ... you are so inspiring! Brittany, I love your blog because I your real self shows in every post. You don't try to be someone you are not,. You are a real person and that what makes this blog so sincere. I hope the best for you and your family and may 2015 bring you blessings and good fortune! It hasn't been that long ago that my husband and I were also struggling to make ends meet. To lose your car - and maybe nearly your life - just before Christmas must be quite a blow. These challenges are always rough to get through, but pinching pennies all along helps lessen the impact. Thank you, Brittany, for all of your always timely suggestions! I'd like to suggest to all of your readers that if you feel uncomfortable donating to Go Fund Me, and if you are able, you could help by buying something from Brittany's Wacky Tuna site on Etsy. It might be too late to receive her items before Christmas, but I see plenty of things that would be great for New Years or Valentine's Day. This post came at high time for me, darling! It has been quite a year for me, and times are (sorry to say it on this day, but is so) tough - and require some "belt-tightinening" on every field. I like your ideas, I use them daily.. since, so many things tend to steal-away your cash without you ever knowing it. One must be weary of the hidden thieves!